Limelight of Genesis was born on April 1st, 2009. She is sired by our 2-time AHR ‘National Champion Stallion’ and 4-time consecutive AHR ‘Stallion of the Year’, Arno van het Nieshof. 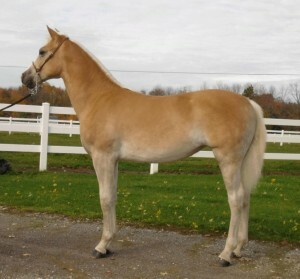 Her dam is Libee’s Lady of Pewamo, an AHR Gold classified mare. Naming ‘Limelight’ shortly after she was born was a simple task… Within hours after her birth, she had the most definitive ‘look at me’ expression that just commanded your attention. When visitors would come to see her, she truly seemed to bask in all of their compliments and enjoy the ‘limelight’…and so the name ‘Limelight’ came to fruition. As she has grown from an eye-catching foal to a tall and elegant weanling, this name has suited her well. Limelight made her first show ring debut at the 2009 AHR National Show. She was the 1st place weanling filly in the pleasure weanling filly division. Limelight’s second show ring appearance was at the 2009 AHR Futurity. Limelight won 1st place in the competitive Junior Weanling Pleasure Filly class and went on to be named pleasure ‘Junior Champion Weanling’. The icing on the cake for Limelight though was when she competed in the AHR Stallion Incentive Program’s (SIP) Pleasure Class against 26 other eligible foals and came out of the class with the 1st place ribbon. In essence, this means that Limelight truly stole all of the ‘limelight’ and was considered to be the best pleasure weanling at the entire futurity! Her 1st place finish in this class helped contribute to earning Arno his 4th consecutive AHR ‘Stallion of the Year’ title based on the performance of his offspring at the 2009 AHR Futurity. 2010 UPDATE: Limelight finished her 2010 show season as once again undefeated! Limelight was named the ‘Champion Yearling’ at the Buckeye Haflinger show in July. At the GLHA Futurity, she was also named ‘Champion Yearling’ and won the ‘Stallion Service Class’ on Arno’s behalf. Limelight won 1st place in the Yearling Filly class at the AHR National Show, and went on to be named the 2010 ‘Junior National Champion Filly’. Limelight has been sold to Wingspann Haflingers and we wish them continued success with this show-stopping filly! Congratulations, Limelight! We are confident that your future holds a lot more opportunities to bask in the limelight of the winner’s circle!